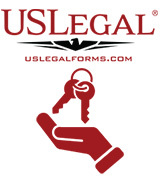 USLegal offers the widest selection of legal forms complying with the laws of your state. In the Landlord Tenant Residential Lease package, you will find a lease application, lease, and other necessary documents. 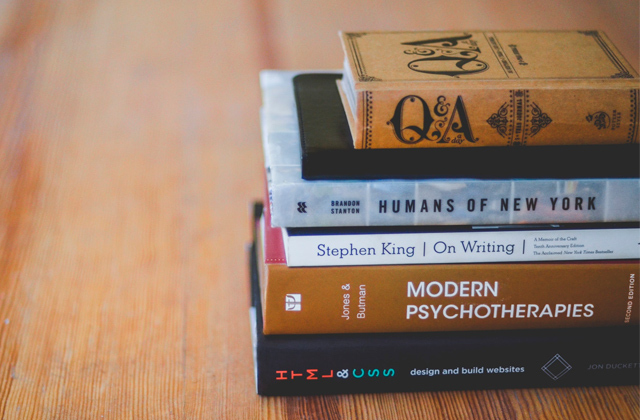 The selection is so huge that it might take you some time to find the documents you need. Perfect for your real estate needs, these state-specific USLegal forms are ultimately correct and valid. 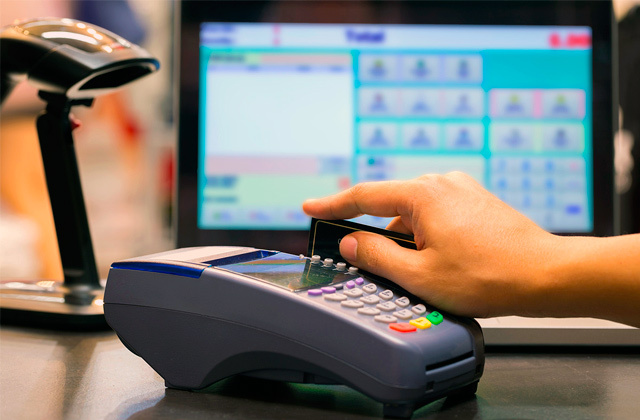 Buying a package is more beneficial in terms of price than getting individual forms. Attorney prepared, these lease agreement forms are up-to-date, state-specific, and accurate. With all formats available, you can print any document right away or save it on your computer. It might take a good while before you get feedback from a customer support service. 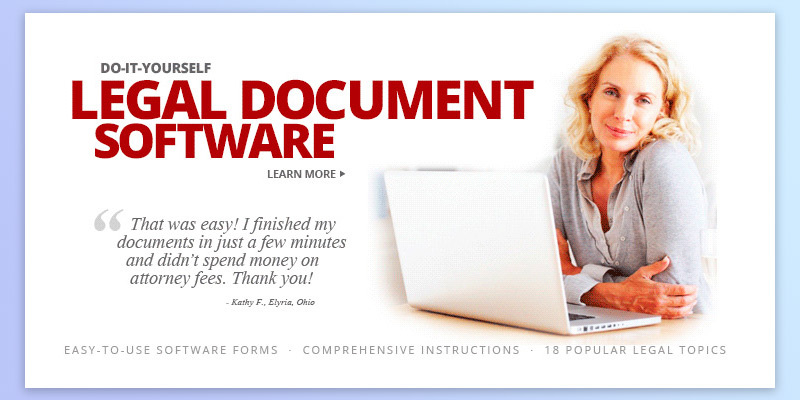 You can get high-quality legal documents at a very low price (some of them are even for free). Thanks to the convenient website design, it is pretty easy to find, buy, and download the forms you need. You can get a 1-year pro or 1-week free trial subscription to have an access to all documents on the website, or a 5-year subscription to edit, update, download, and print your rental/lease agreements. 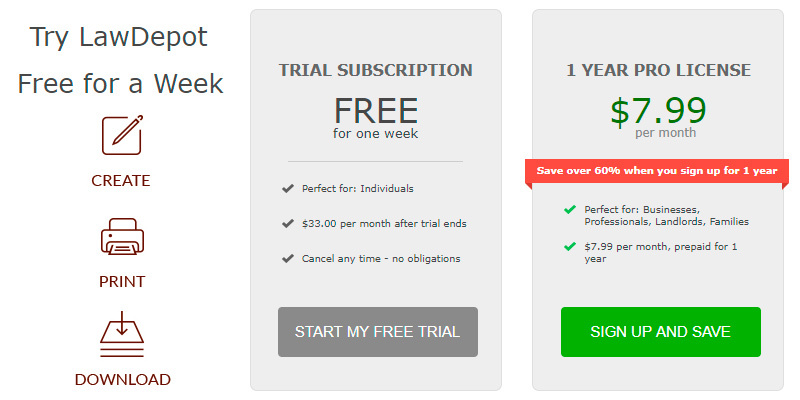 A free subscription trial period lasts for one week only. 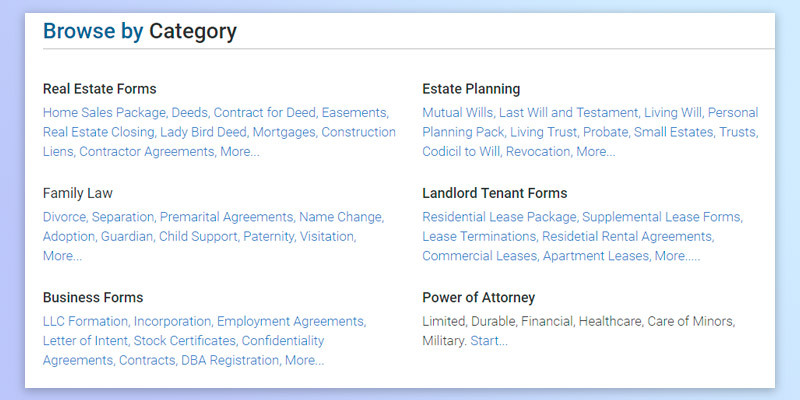 You will be able to customize a legal document for managing your rental property step-by-step. The website creators did their best to make this process as quick and effective as possible. 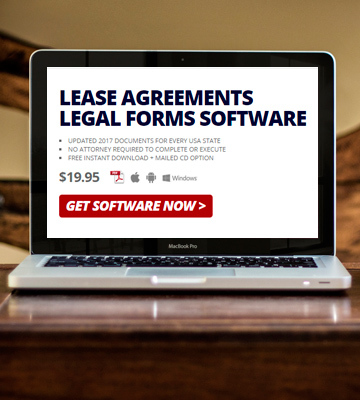 This Standard Legal's software will help you create your custom commercial or residential lease agreement in a breeze. Financial Calculators software will be given as a bonus. There are no individual forms available, so you need to pay for the whole package. 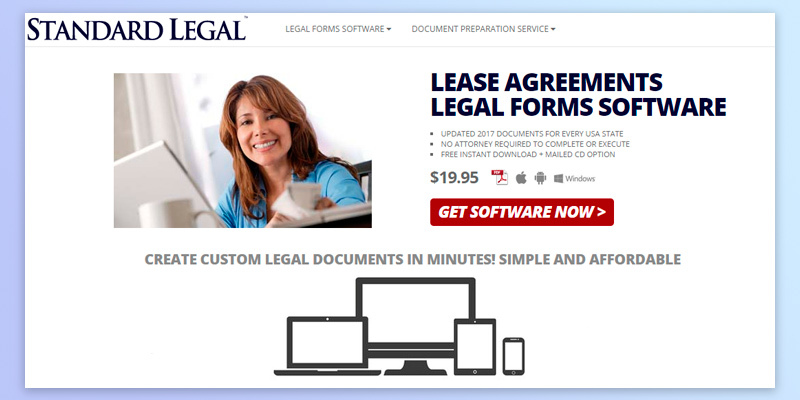 Compatible with Windows, Mac, Android, Linux, and iOS, Standard Legal's software can be used on nearly any computer or gadget. It is an excellent value for money. 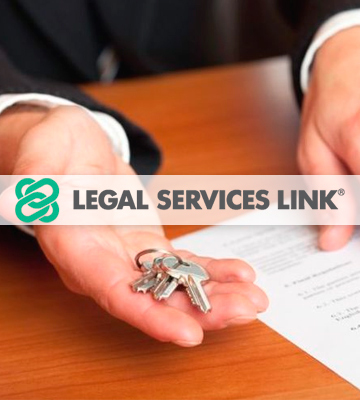 If you need attorney's advice on your real estate leasing agreement, post a summary of your legal needs at the Legal Services Link website and you will receive e-mails from the professionals ready to help you with your legal issues. Suitable if you need an attorney's advice rather than do-it-yourself legal forms. 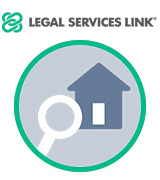 Legal Services Link is a comprehensive platform that will help you find an attorney quickly and easily as soon as you set up your free account. Your communications will be routed through the website until you find the best attorney. Founded by professional attorneys, U.S. Legal Forms Inc. has been providing state-specific legal documents online since 1997. 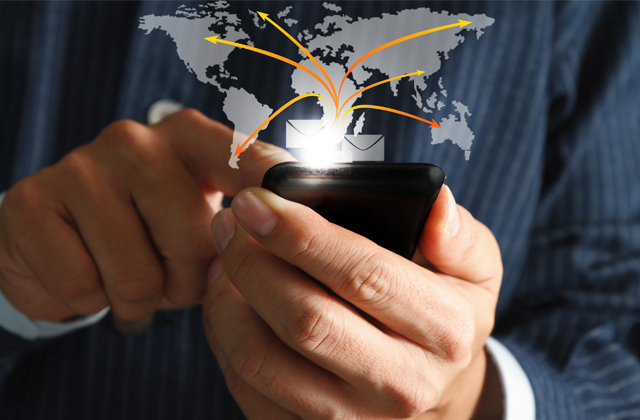 With its 20-year experience and professional approach, the company takes up the leading position as the biggest and the most popular source for legal forms on the Internet. They offer more than 85,000 legal forms (the widest selection online) for consumers, small businesses, and attorneys. 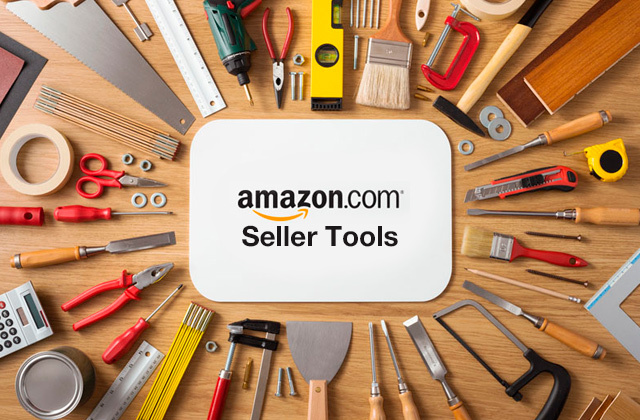 Just browse the package you are interested in and select your state to find valid forms you need. To make it easier for users to find the necessary documents, the most popular forms are shown before additional ones. Moreover, the USLF offers an excellent consumer service; if you have any question, you can call their customer support or leave a message to get a callback. 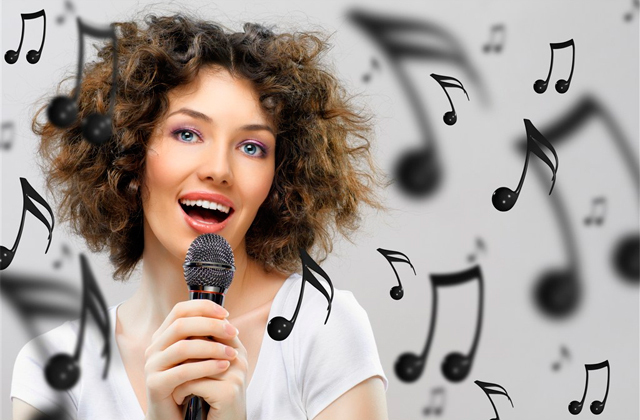 With a 100% satisfaction guarantee provided, you will get a full refund if you are not satisfied with the product. 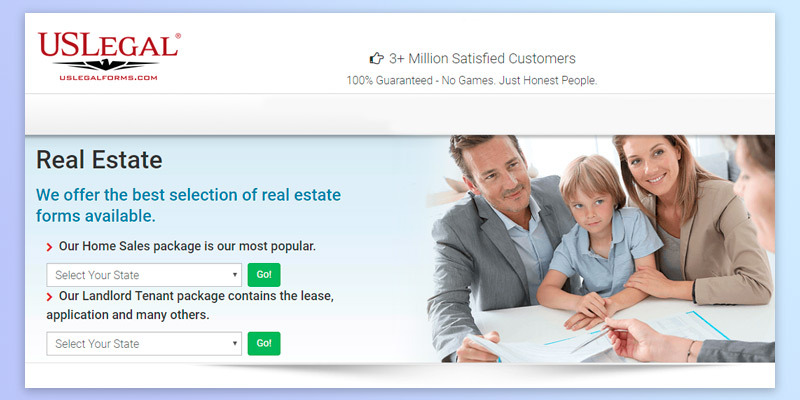 On this website, you will find an unlimited choice of legal forms, including those for your real estate needs. 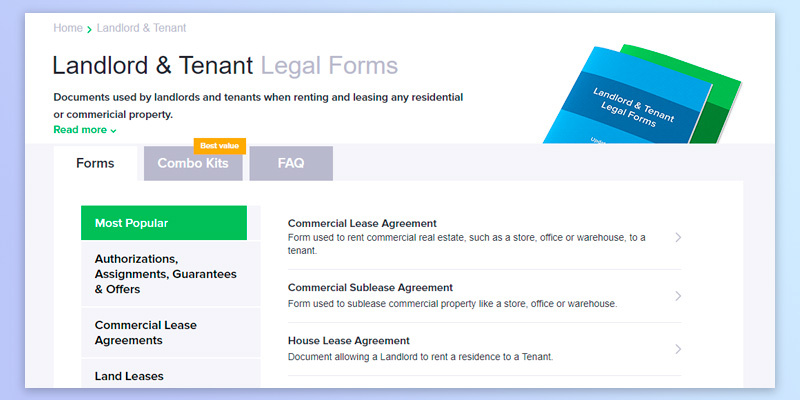 Among them, USLegal offers landlord-tenant forms for commercial and residential use, such as lease applications, property rental agreements, lease termination forms, and other necessary documents. Literally, any document you need is available here; you can buy either individual forms or a package (it is more beneficial in terms of price). Along with blank lease agreement forms, you will get helpful tips on completing them. In addition, the website provides comprehensive instructions on the steps you need to take in order to minimize potential problems while creating your residential lease agreement. It is not a secret that many of the standard lease agreement forms you can find on the web and download for free are not valid. USLegal offers a huge variety of legal forms, and each document is state-specific and professionally drafted. 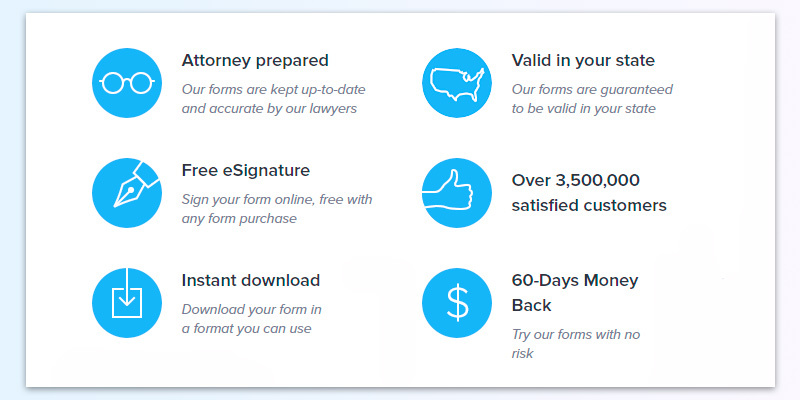 By purchasing their forms and packages, you will get the same documents attorneys use but will save on legal fees. However, you should keep in mind that the company does not provide legal advice; for serious legal matters, please, consult a lawyer. 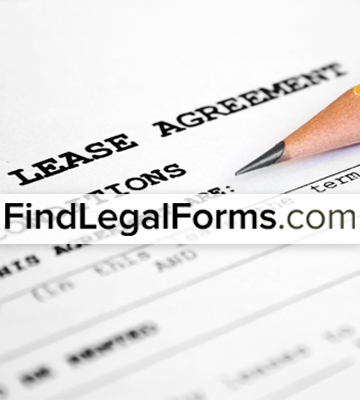 The FindLegalForms.com website offers attorney-prepared legal forms that are up-to-date and specific to the laws of your state. Moreover, they offer documents valid in Canada, the UK, Australia, and India. The company policy is to provide high-quality legal documents at a low price. 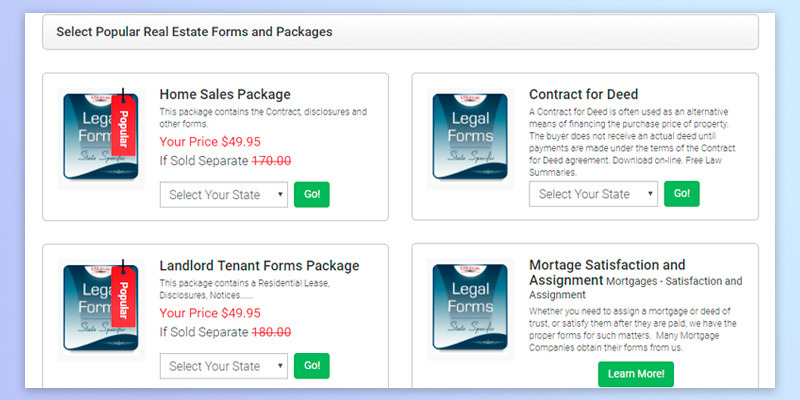 They have done their best to create a comprehensive website design, so you will find printable lease agreement forms you need quickly and hassle-free. For your comfort, legal forms are available in multiple formats including Word, PDF, and RTF; no special software is needed for downloading documents. As soon as you make the payment, the form will be available for download, so you can print it or save. If you have questions, you can call to the customer service or send a form describing the issue you have faced. 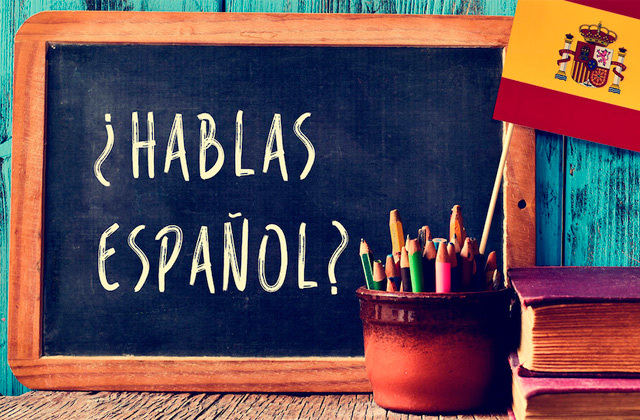 There is also a section with the most frequently asked questions, and the answer you are looking for may be there. To find the form you need, you can either type it in the search line or browse popular forms. You'll find lease agreements, rental applications, and other documents for a house/apartment/room rental agreement in the Landlord & Tenant section. With a user in mind, all the necessary information is very easy to find. On selecting a particular form, you will get access to its description, details (such as a number of pages, dimensions, etc. ), info on combo packages available, and customer reviews. 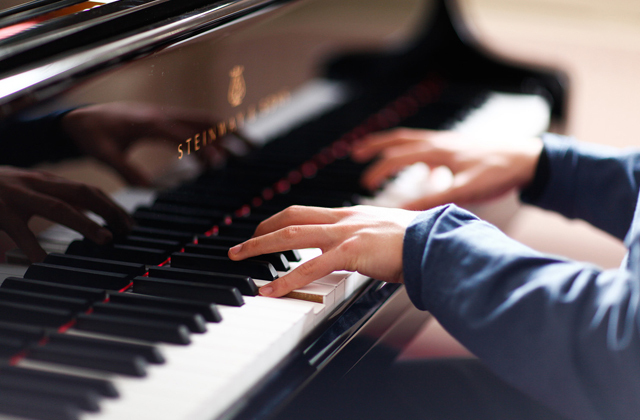 Extensive instructions on how to complete your rental agreement are included as well. You will also get some general advice that will help you avoid any miscommunication and hence, any future conflict between the parties. However, you should keep in mind that before signing any form, it is advisable to consult an attorney in your state to make sure the rental agreement form addresses your particular situation. Finally, we would like to say a few words about the services provided. 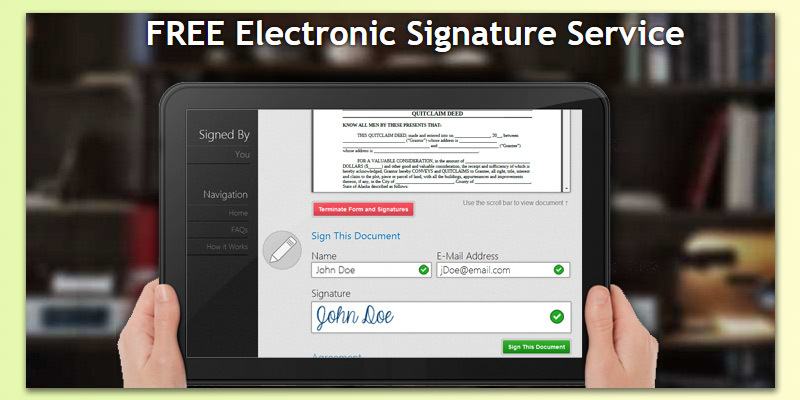 FindLegalForms.com offers an innovative Electronic Signature Service allowing you to safely share and sign documents online. It is available to all visitors for free. Besides, on the website, you can find a wide selection of legal articles and guides helping you fill and organize documents properly; there is also a LAWGURU section for finding an attorney in your state. 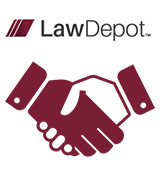 Founded in 2001, LawDepot boasts an extensive library of high-quality legal forms and resources to help its users save lots of money in legal fees. You can even get a free trial subscription with unlimited access to all documents on the website. All legal forms are prepared by lawyers; they are accurate, valid, and specific to your state laws. It will take you just a few minutes to customize, download, and print your house/apartment lease agreement or any other document you need. If some questions occur, you can phone or email LawDepot Help Centre. The website also features a live chat where you can ask questions and get answers to your requests. One Year Pro license (you will be able to select, customize, and print any document during one year). 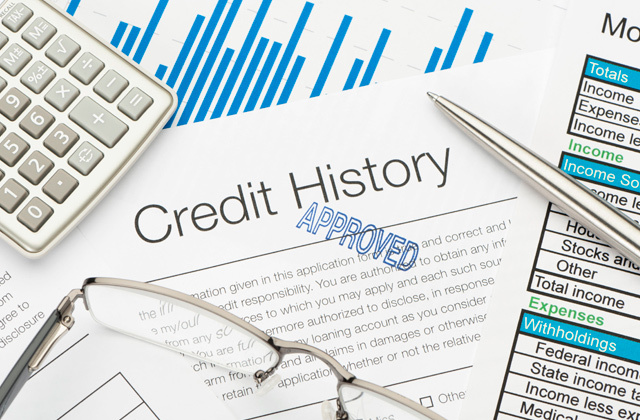 There are also other options provided, like a 5-year subscription to editing, updating, downloading, and printing your Rental/Lease Agreement. The prices may vary depending on the document you need. However, having chosen one of subscription options, you will get an easy access to the needed forms and save some money. 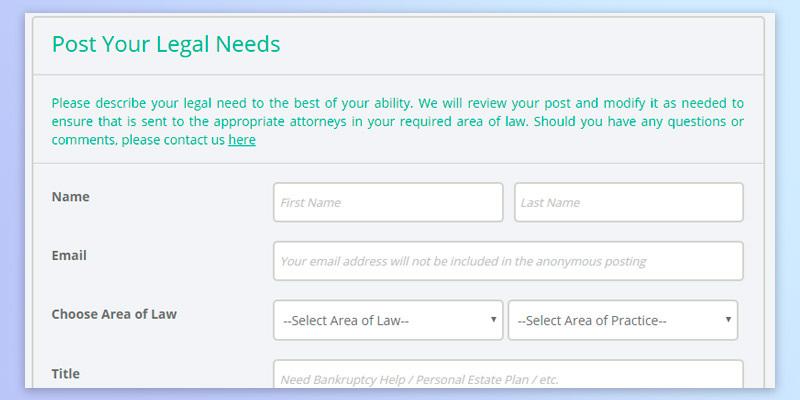 The LawDepot website has a comprehensible design allowing you to find necessary forms easily. 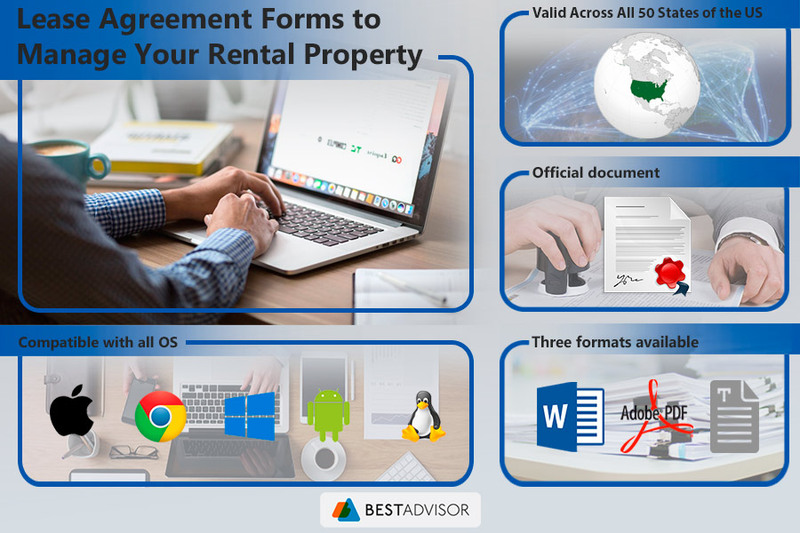 Whether you are going to lease your rental property, you will be able to quickly find an appropriate apartment, room, house rental agreement template. 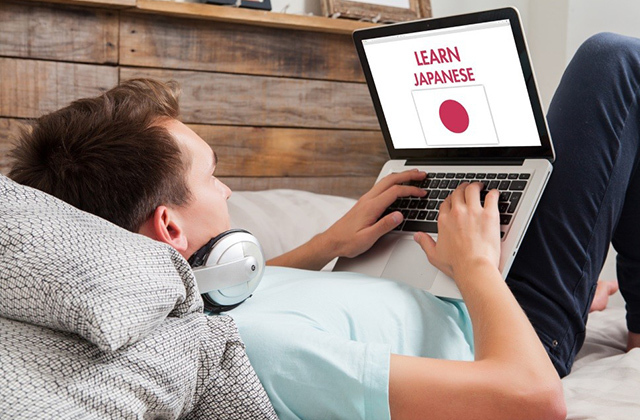 After that, you can answer a few questions online to specify some points such as the contract length, rent price per month, late payment fees, damage deposit details, permission to smoke and have pets, and other lease details. In other words, you will be able to customize the house, room, or apartment lease agreement template to your needs before you download or print it. 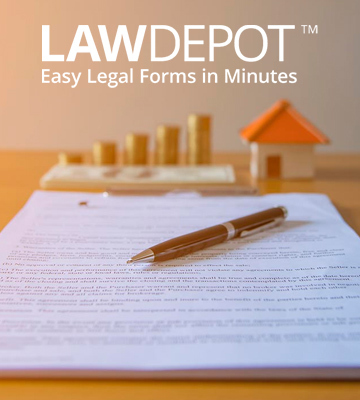 Millions of people already use the LawDepot legal forms, and most of them admit that the resource is both cost-effective and easy-to-use. 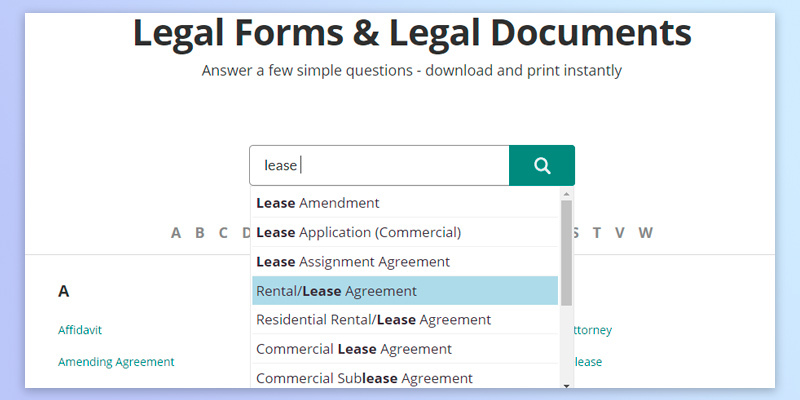 This Standard Legal software is one of the best resources for customising your rental lease agreement, and now we will explain why. First of all, after you download the software on your device, you can fill the forms offline, which means all your personal data will not be transmitted across the Internet (unlike online web forms); it will stay private and secure. 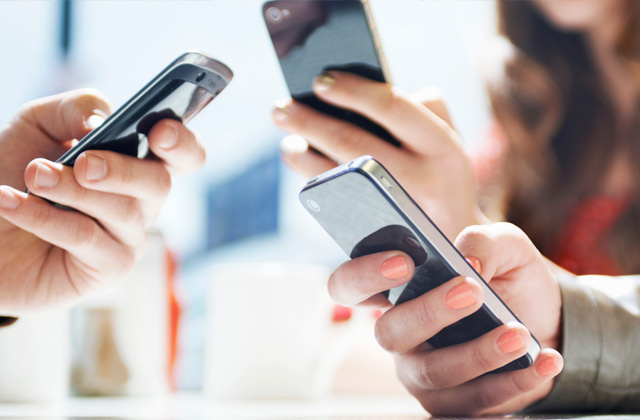 As soon as you complete the purchase, you will get an immediate access to the software from nearly any gadget, including your desktop PC, tablet, laptop, or mobile device. Prepared by qualified attorneys, all Standard Legal forms are state- and territory-specific and are constantly updated after every change in a state or federal law. Thus, you will be able to create the most accurate and valid rental agreement quickly and easily in the comfort of your own home. Whether you are going to lease your real estate property or have already found an apartment or a house to rent, a written rental contract is a necessity to make sure all the conditions are fulfilled. No need to say, the document must be accurate, comprehensive, and valid in your state. The Standard Legal Lease Agreement package includes forms for apartment and home leases (furnished/unfurnished) as well as commercial property, equipment, and personal property leases. With this software, you will be able to easily customize the necessary document by yourself without the expert help, thus, saving quite a lot of money. The website also offers a document preparation service. You can choose the type of lease that meets your needs and then provide all basic details, answering simple questions by phone or email. After that, Standard Legal professionals will prepare the document for you. To make sure all the data is correct, the answers will be e-mailed to you for your confirmation before the agreement is drafted. Once ready, your room/apartment/house lease agreement will be sent to you in PDF format (attached to an e-mail) along with comprehensive instructions on signing and completing the finished document. 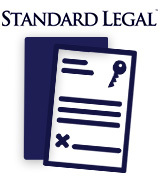 The Standard Legal service provides a 100% satisfaction guarantee, so you will get your money back in case there is some issue with the content or the document is not accepted. All the information you provide is confidential. It will be deleted as soon as your document is completed. 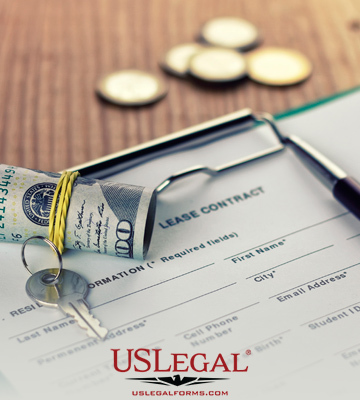 While residential lease agreement forms are affordable and easy-to-fill by yourself, there are many cases when you need qualified attorney's advice. That is why we have included the Legal Services Link in our review. 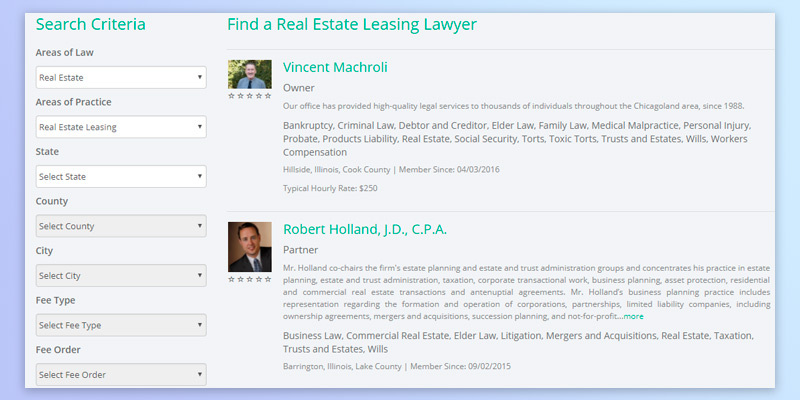 It offers a simple and effective way to find your real estate leasing lawyer. The platform was created in order to make it easy for everyone with legal needs to find a professional who is ready to help them. 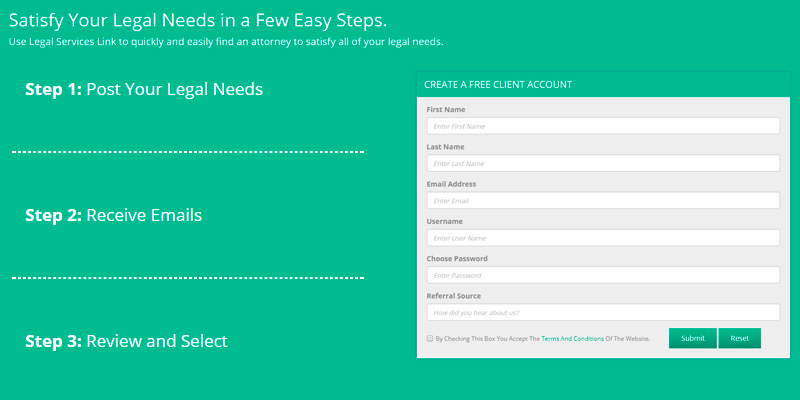 At the same time, it is a wonderful online tool for attorneys to get new clients. What makes this source different from others is that you can find an attorney in minimum time and with minimum efforts by posting a summary of your needs and then reviewing profiles of available lawyers. As we have mentioned above, besides searching a lawyer in the source database, you can simply post your project and wait for e-mails from local attorneys ready to help you. This innovative approach will help you save both time and efforts during your search. It is easier to find the lawyer you need when you have a large list of professionals who can help you. To accept the application, you just need to click a button. After hiring an attorney, any further communication is done offline. If you are an attorney looking for an effective tool to offer your services to potential clients, this platform is just what you need. As soon as you create your profile, you will be notified by e-mail of projects in your area of law and geographic location. Both attorneys and people looking for legal advice can sign up for free. However, to respond to as many projects as they want, attorneys need to subscribe for a Premium Account. Designed to make the legal hiring process as easy and effective as possible, the website features a user-friendly navigation and comprehensive design. There is also a section with helpful legal articles covering various areas of law that may respond to your questions. All in all, it is the best platform for finding a professional to handle your real estate legal needs and the perfect tool for attorneys to get new clients. Whether you are a landlord going to rent your residential property or you are a prospective tenant, you may be interested in signing a lease agreement to have your rights protected. Today, there is a great number of services offering rental agreement templates you can fill by yourself. 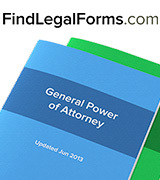 These legal forms are available online at a fraction of the money you pay to an attorney. The services offer lease agreements that are accurate, valid, can be tailored to your needs, and comply with the state laws. In addition to the length of the lease and monthly payment, the document outlines obligations and responsibilities of both parties; to avoid any misunderstanding and possible problems in the future, it should be both comprehensive and detailed. 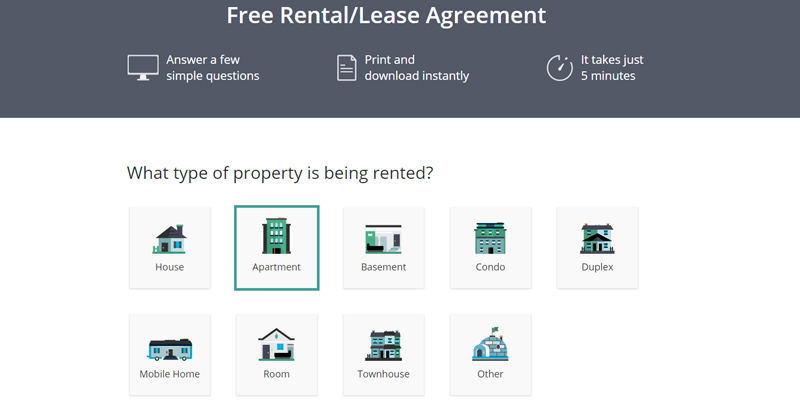 We have made this review to help you choose among the best online sources that provide high-quality landlord-tenant forms. Sometimes you can customize legal forms and prepare the documents by yourself; however, there are cases when you need legal advice. Using an online search platform is a fast and effective way of finding a local attorney to handle your real estate legal needs. Both lease and rental agreements are concluded between a landlord managing their residential property and a tenant. However, there is a particular difference between these two contracts that you should keep in mind before preparing your documents. Let’s have a closer look at both types. A lease agreement is a contract usually concluded for a period of six to twelve months or even longer, during which neither tenancy length nor any other condition of the document can be changed. Moreover, to protect the rights of both parties and avoid any misunderstanding and possible problems, this agreement should include all essential requirements. 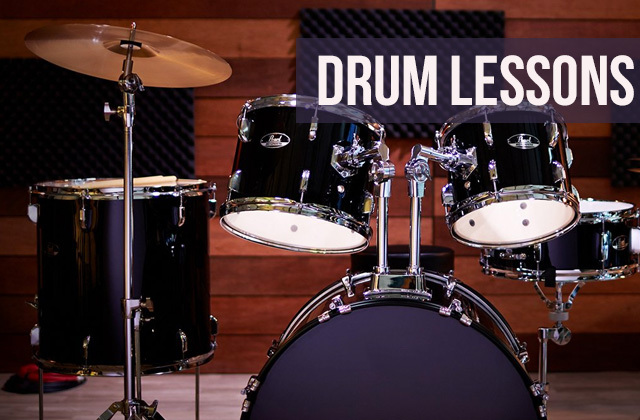 Outlining responsibilities of both parties, it should also specify a security deposit amount, sublease permission, termination, and other important terms. For instance, tenants cannot just leave an apartment, otherwise, they will lose their security deposit and might be obliged to pay the rent till new tenants move in. Having signed a residential lease agreement, the property manager will get a stable income throughout the contract term. The advantage of making such an agreement for tenants is that they will pay the agreed rental amount even if rent prices rise. Only when the lease ends, a landlord can change rental terms. This is why a longer-term lease is even more beneficial for lessees if they find the price acceptable and are not going to move out before the term expires. If the tenant is not planning to leave, a new residential lease agreement can be signed on the conditions agreed between the parties. 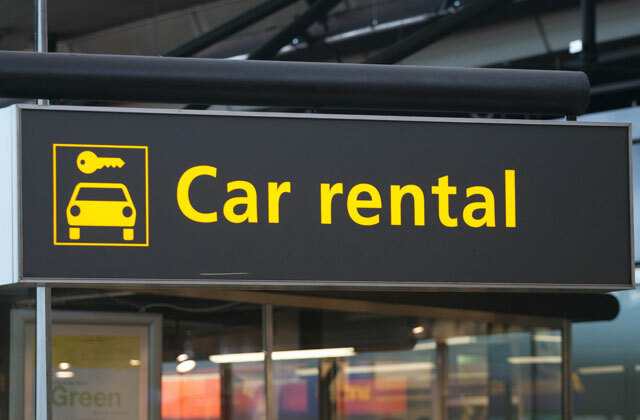 A rental agreement can be simply viewed as a shorter, or a month-to-month lease agreement. In other words, it specifies responsibilities of the parties, the rent to be paid, and other important terms and conditions. However, unlike standard lease agreement, its content can be changed on a monthly basis. For example, a property manager can renegotiate the terms and raise the rent price when the old contract expires. Nevertheless, a room rental agreement is the best option for short time renters who are only staying at one place for a few weeks. In case the contract is not updated, it stays in force until the premises are vacated. As you can see, both types have their advantages and disadvantages; it is up to you to decide which one is more acceptable for you at the moment. 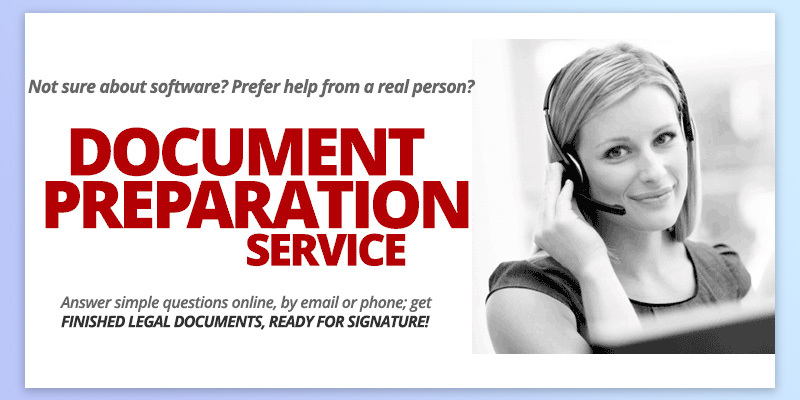 In any case, you need the document to be well-prepared, comprehensive, and accurate. So, we highly recommend you to use trustworthy legal forms services.